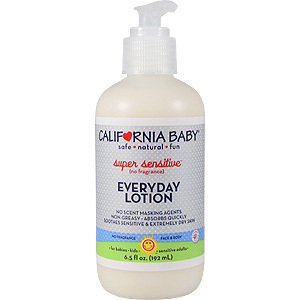 California Baby®'s luxurious Super Sensitive™ Everyday Lotion is perfect for those with allergies or fragrance intolerance or who are following a homeopathic regime. In addition to being free of fragrance or scent-masking agents, this hypoallergenic lotion does not contain any gluten, soy, oat, dairy or nuts except for coconut (seed of a drupaceous fruit), which is not typically restricted in the diets of people with tree nut allergies. Vitamin E and aloe vera are infused into high quality, cold pressed vegetable oils that are non-greasy and absorb quickly to create a silky smooth lotion that leaves the skin with a long-lasting satiny finish - an excellent bed or naptime lotion. Keep skin healthy and make this part of an after shower or bath routine. Our custom pump locks in the 'up' position making this lotion perfectly portable in a diaper bag, gym bag, or backpack without worrying about a mess.